"What is art for?" is a short question that has long been pondered by many individuals. Answers are endless, depending on who's responding. Some people are certain that art has, above all, a therapeutic value: Its purpose is to heal different levels or aspects of our being. Others say it's meant to shock and shake us out of complacency about important issues. Still others understand art's role as that of telling stories--the mythology and/or history of a people--or of imagining a different world. Some consider art as a way to make money. For others, it's a means through which to express emotions, spiritual visions, and ideas. According to author and lecturer, Ellen Dissanayake, there are four key premises regarding the role art plays in human life. First, we have a basic need to embellish, decorate, and personalize. The arts also engage and activate our senses, which can have a powerful effect on our body, mind, and heart. The arts are involved in sacred and non-sacred rituals as well. And, last, we share cultural experiences through art, whether making it or receiving it in community. For those who think of art only in lofty terms--that is, irrelevant to our everyday life--they might be surprised to learn how practical it can be in something as simple yet essential as seeing better. I have sometimes wondered whether we enter the field of art because we are already keenly aware of what's around us and in our mind or because we want to perceive even more acutely and art can help us do that. Since I never demarcated before and after in my own life, in terms of art involvement, I can't say which is true. I do know that I tend to be visually alert. Nevertheless, details can escape me when I become preoccupied and distracted. That's why I was intrigued to read about what law enforcement personnel and medical professionals are deriving from viewing art. It's teaching them to be more skillful in their work and not let important details escape them. Don't we all want our health care practitioners and police officers to be more effective on the job? At times, we might find that our lives are in the hands of their observational skills. 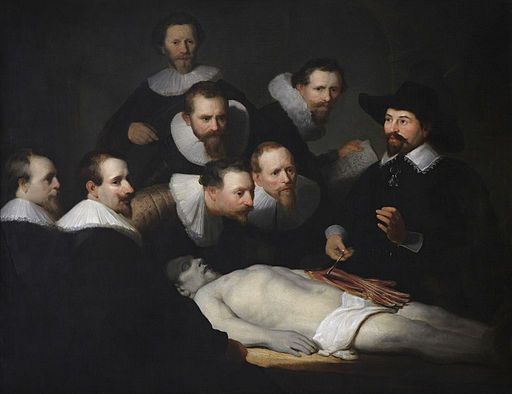 In order to get medical students and young doctors to look up from their laptops and observe patients more closely, Linda Friedlaender, senior curator of education at the Yale Center for British Art, and Irwin Braverman, a dermatologist at Yale's medical school, teamed up in 2001 to initiate a program of developing the art of looking by actually looking at art. Since then, other medical education programs have availed themselves of this tool. How it works: First, participants spend at least ten minutes with a painting at a museum; then they're asked to describe it in as much detail as possible; and, finally, they explain what the artwork represents. The result, eventually, is better diagnostic and descriptive skills. For example, at Brigham and Women's Hospital, first- and second-year medical students can meet weekly with curators at museums in Boston to study a variety of concepts, such as symmetry, texture, form, and motion. Viewing a limestone sculpture from various angles gets translated into observing breathing patterns in patients with respiratory illnesses in different positions. After inspecting El Jaleo by John Singer Sargent (1856-1925), they assess balance, stance, and step in patients with gait issues. Those students who have attended the 9-week course have made 38 percent more observations when examining patients than those who have not taken it. One participant, Dhruv Khullar, has written that while the learning is "subtle and indirect," it still "ingrains insights deep within your consciousness. You feel and know even before you can think or speak." Now a resident physician at Massachusetts General Hospital and Harvard Medical School, he has found the lessons in Yale's program popping up unexpectedly while doing patient rounds, noticing and describing more: "asymmetry on an old man's face...angry purple blisters...shadowy contours of pneumonia on an X-ray." But improving diagnosis is not all that the program accomplishes, according to Khullar, who also blogs for the New York Times. It helps students deal with the ambiguity inherent in both art and medicine by broadening their thinking. Instead of rushing to what may prove to be a misdiagnosis, they consider a number of possibilities before arriving at an interpretation of what they see in a patient. In addition, studying art helps doctors to interpret emotional expressions better. So, instead of relying mostly on technological testing, doctors become more capable of evaluating a person's condition using their own senses, which is how physicians were originally trained before the onset of sophisticated equipment. The New York Police Department might seem another unlikely population for art lessons, yet his kind of learning has important ramifications for them as well as the medical students. Last year, Amy E. Herman, an art historian and attorney, escorted a group of officers through the Metropolitan Museum of Art. Building on the program started at Yale, she has also worked with FBI agents, CEOs, ER physicians, first responders, and others who need to improve their visual perception and communication. She told the cops they weren't there to learn about art per se. Rather, she was "using art as a new set of data" to help them better employ their skills on the job. For Herman, a work of art is not simply a cultural, aesthetic, or commercial object. It's "an invaluable repository of visual detail" that can help shed light on, for example, how to approach a murder scene. In other words, it's an aid to critical inquiry. It doesn't matter what we label the act of viewing; it matters what shifts inside of us. Henry Thoreau wrote, “The question is not what you look at, but what you see” (Journal, August 5, 1851). Has being an artist or lover of art changed the way you look/see/view? If so, how? How have you helped others to see better through your own art? What is your experience with children around this issue of looking/seeing? Do they see more/better? Is "inattentional blindness" something that happens only to adults?